Driving past the boundaries of civilization on an ATV can be exhilarating. However, this beloved piece of machinery can cost you a lot. Protecting it from more than just unexpected boulders is important. 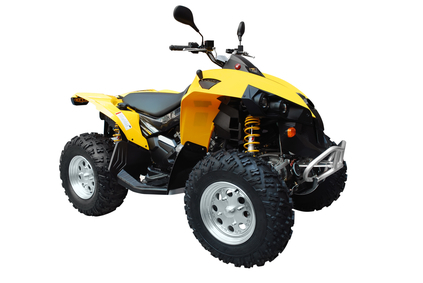 ATVs can be insured to protect them from accidental damage and theft. ATVs have a high-theft value, so leaving them uninsured is an unnecessary risk, according to Geico.com. There are two options for vehicles like ATVs that see a lot of bumpy driving are prone to damage: paying out the nose for repairs, or paying a much higher rate for insurance. Comprehensive insurance will cover any damage that is not collision damage. It does not usually cover minor accidents like dings and scratches, unlike car insurance, because ATVs are designed to be driven in rougher conditions. Though it may seem like an unnecessary expense to insure a vehicle you may only use once a year, many states require insurance on vehicles other than cars and trucks. Homeowners insurance will cover the vehicle if it remains on the property. There are different kinds of insurance for ATVs with different levels of coverage, much as there is for cars and other high-value items, and like looking for car insurance, Compare the Market car insurance quotes comparison may be the best way to save some money. Comprehensive insurance will cover damage that is non-collision damage. Collision damage will cover significant damage that is caused by hitting a tree or other object, or another ATV. It will not cover minor damage caused by everyday riding. Bodily injury and property damage liability will cover damage done to your own body or property or damage done to property of others. You can set the dollar amount you want this to cover. And there is uninsured/underinsured coverage. This will protect you in the event that the person who does damage to you or your vehicle does not have enough insurance to cover the damage, states Progressive.com. Bundling your ATV insurance with your car and home can take the overall costs down. Consider how you will protect expensive accessory equipment like helmets, jackets and trailers. Comprehensive insurance is unlikely to cover those items. Insuring your ATV can help if you injure someone else or do damage to another person’s valuables while using your vehicle. Paying out of pocket for a collision is not going to be cheap. According to extendedpowersportswarranty.com, it can cost anywhere between $500 and $3,800. Insurance is not the only way to keep your quad safe. Investing in a good lock can prevent opportunistic thieves from making off with your vehicle. There are a variety of locks on the market, all with different levels of protection. Although it may seem tempting to go with the cheaper options, spending the money upfront on an expensive, reliable one can save you big time. Tracking devices like LoJack can help find your vehicle if locks were not enough to keep the thieves away. If you do not have to make a claim on your insurance, this can help keep the cost down, as you avoid having to pay any deductibles or premiums. 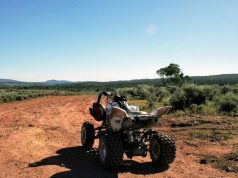 Enfotrace – GPS Tracking Solutions For ATVs and UTV.